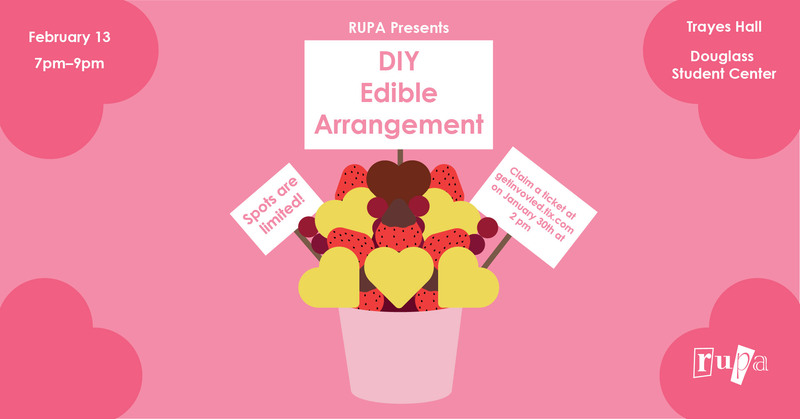 02.13.09–[DSC, Trayes Hall]–Join RUPA and make your very own Edible Arrangement! Make it for your special someone for Valentines Day or enjoy it by yourself. All supplies will be provided. Claim a ticket for the event on January 30th at 2 pm on https://getinvolved.tix.com. If you claimed a ticket, you are not guaranteed a spot at the event. You must be one of the first 75 people in line the day of the event and have your ticket and RUID. The event begins at 7PM and doors open at 6:30PM.